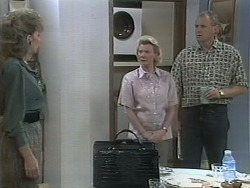 Toby leaving Ramsay Street with Noeleen as Kerry and Joe look on sadly. CAROLINE: You could find a better job than *that*. CHRISTINA: I'm only marking possibilities. CHRISTINA: So why can't we just move back there? CAROLINE: That would be no good because *I'd* have to travel then. CHRISTINA (coolly): The difference is *you* can easily get another job with your experience. CAROLINE: I *like* working for the Robinson Corporation – it's the perfect career step for me. I don't want to leave. CAROLINE: We always knew the time would come. I guess this is it. CHRISTINA: Well... I suppose you're right. It's not as if I can't manage on my own. And I've probably been living in your shadow for long enough anyway. CAROLINE (warily): That sounds like Trevor talking. Did you 'phone him? CHRISTINA: Well, I thought I should explain why I left so suddenly. CAROLINE: I didn't think you were that keen on him, especially after he let you down so often. Is he the reason why you want us to leave? CHRISTINA: No! I don't know... At least he's a friend; I don't have any of those in Erinsborough. Caroline tells her sister to give it some time; just mix a bit more. Christina groans that she's tried that, but the bottom line is that she just wants to go back to the way they were. Caroline pleads with her to try a little bit longer – and if it doesn't work out, *then* they'll talk about leaving. There's suddenly a knock on the front door and Caroline goes and answers it to find Helen standing on the step. She invites her in and Helen asks her if she can take some Home James files into the office, as Paul needs them urgently. Christina joins them and Helen asks her how she is. Christina shrugs that she's all right. Helen then invites the twins for dinner, and Caroline smiles that they'd love to come. JIM: Yeah, sure. Why should *today* be any different, eh? HELEN: Oh Jim, I'm getting so tired of this atmosphere. Now, why don't you make up? Give Beverly the necklace and then we can all get back to normal. JIM: I'm not in the mood to give Beverly the necklace and she's not in the mood to receive it. JIM: In my own good time. With that, he, Todd and Nick head out. Helen heads through to the lounge room and asks Beverly if she'll be in for lunch. Beverly nods that she should be. She then asks Helen if she's seen her calculator. Helen replies that she thinks she saw Jim using it last night. With that, she heads off to the shops. Beverly walks over to the desk and opens the top drawer. She looks in it – and finds a gift- wrapped little parcel inside. She tears off the wrapping and finds the case with the necklace in it. She smiles as she undoes the clasp and puts the necklace round her neck. She goes to look at herself in the mirror, but is interrupted by the 'phone ringing. She answers it and then tells the person that she'll be there as soon as she can. She then picks up her bags and heads out. Two men are sitting outside the Coffee Shop, drinking from bottles of beer. Gloria walks over to them and tells them to put the bottles away, as they haven't got a licence there. One of the men tells Gloria that it's milk they're drinking! Gloria rolls her eyes and tells them to keep it out of sight, as she doesn't want her boss to see them. The guys smile that she's a good sport. 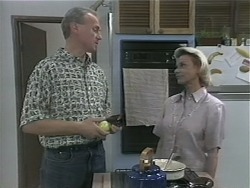 Des approaches suddenly and Gloria says to him quickly that she's got the perfect table for him inside. 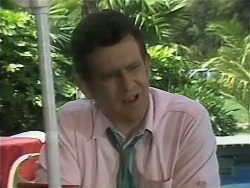 Des, however, sits down and says he might catch a few rays: it's a perfect day for it. The two men with the beer bottles start laughing loudly and Des looks round at them. Gloria glances at them nervously. JOSH: Mate, are you going to help me launch it or whinge? TODD: Oh, I don't know. I've got heaps of homework to do. JOSH: Mate, I don't believe you – you're *still* hung up about Melissa, aren't you? TODD: No, not really. It's just we used to hang down at the lake and I don't want to go down there and stir up old memories. JOSH: Todd, stop being a dag. It's *over* between you two. Just forget her. There are plenty more guppies in the fish pond. HELEN: I'm so pleased you've made up. HELEN: Oh, and it looks lovely! JIM: I don't believe it. You just took it from my drawer and wore it. JIM: I *was* waiting for the right moment to give it to you, but for you to go rummaging through my drawer is rude, inconsiderate and an invasion of privacy. BEVERLY (retorts): I was not rummaging, I was looking for my calculator, which *you* took without asking. JIM: It's hardly the same thing. BEVERLY: 'Waiting for the right moment'. Huh! JIM: No, you're right – you're right, absolutely right. How could there possibly be a right moment? You're at work 24 hours a day; I never *see* you. JIM: And another thing: where did you find out about the necklace? JIM: Will you tell Beverly she is being unreasonable? BEVERLY (warns Jim): Don't drag Helen into our fight. She knows only too well who's being unreasonable. Right, Helen? HELEN (sternly): No, *wrong*, Beverly. Look, I am sick to death of your constant bickering. The atmosphere in this house is unbearable at the moment. You are two supposedly- intelligent people. Now, for heaven's sake, sort out your problems before you drive me out of here. CAROLINE: It's a really friendly atmosphere here, isn't it? DES: Speaking of atmospheres, how are Paul and Melanie getting on? CAROLINE (looking surprised): Why are you asking *me*? DES: Well, you work with them. CAROLINE: Well, I haven't noticed any friction between them, if that's what you're asking. DES: Oh. I thought Paul might've been on a short fuse because the kids graffitied his car. GLORIA: Hey, I told you two this isn't a pub. That's my boss over there: if he catches you drinking, he'll have a fit. MAN: Hey, Paddy, I think I'm seeing double! PADDY: Must be the coffee! They walk off, leaving Des to comment to the twins that those men were friendly! MELISSA: I suppose you've invited Todd along too. JOSH: No I haven't. Anyway, he's got more *important* things to do – like nursing his broken heart. JOSH (mimics): 'Who cares?' Why don't you talk to him or ask him out or something? NICK: I would've thought with the way things are between Jim and Beverly at the moment, it wasn't exactly a top idea. HELEN: Well, I'm hoping the company will force them to be civil to each other – at least for a while. JIM: I wonder what sort of mood we can expect from her today. JIM: I've got to try to get through to her: make her realise she can't keep on working like this. JIM: I want to be fair. I understand she's had problems, and you were right about giving her more time to get over Rhys. Maybe she needs *more* time? What do you think? HELEN (sighs): Jim, I don't want to be involved anymore. This is between you and Beverly. HELEN: I *know* what you're trying to do, Jim. I'm not going to take sides. BEVERLY: What are we going to do with him, Helen? HELEN: Not *we*, Beverly. I've told Jim and now I'll tell *you*: I don't want to be involved anymore. You two are driving me crazy. 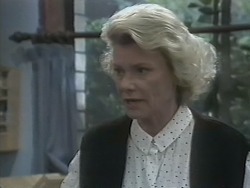 Beverly looks at Helen in astonishment. TODD: This is another one of your set- ups, isn't it? TODD: Yeah, well, it sure looks like it. MELISSA: Yeah, you tricked me into coming here just so you could get me and Todd back together again. TODD: What *did* you mean, then? TODD: *I* thought you didn't like *me*. I've been trying to get back together with you for *ages*. With that, Todd puts his arm round Melissa and they walk off together! Josh starts up his model boat and uses the remote control to steer it into the middle of the lake. He calls to Todd and Melissa to come and have a look – but at that moment, the boat's engine cuts out and the boat sinks in the water! JIM: I'm all in favour of the work ethic – as long as you don't forget there are *other* responsibilities just as important. CHRISTINA: Thank you – maybe she'll *listen* to *you*. [To Caroline] I think you're becoming a workaholic. JIM: Just an observation, darling. BEVERLY (to Caroline and Christina): This is Jim being satirical... I've been working rather long hours lately. JIM: I wasn't referring to that. You're being paranoid. BEVERLY: You see, what Jim fails to understand is that unlike *his* line of work, I can't always leave an ailing patient 'til a time more convenient to me. Some jobs are just, well, more important than others and have to be approached accordingly. I'm sure you agree, Caroline, being a professional woman yourself. BEVERLY: How nice to be young and in love... before it all starts falling apart on you. Caroline sits there looking awkward. MELISSA: I just wish you hadn't spent any money on me. TODD: It's OK! You *deserved* a present after the way I acted like such a doob! MELISSA: I guess we owe one to Josh for finally getting us back together! TODD: Yeah. I'm glad we are, though. With that, the two of them kiss passionately. BEVERLY: *I* think the playground should stay exactly where it is. JIM: I don't think there's any point in you being so bloody- minded. There's another playground within a couple of blocks. BEVERLY: And most kids have to cross busy intersections to get to it, which only increases the risk of accidents which *I'll* have to deal with the results of. BEVERLY: Longer hours for *you*, possibly. BEVERLY: Good – then maybe you'll appreciate *my* position. Caroline chips at that moment in to say that she and Christina really should be going. They thank Jim and Beverly and head to the door. Helen goes with them, apologising as she does so for the atmosphere. Outside, Christina remarks to her sister that she doesn't think she's seen one thing today that makes her want to stay in Erinsborough. HELEN: You'll be pleased to know that *I* didn't sleep a wink – and it's all because of your constant bickering. There's Todd... he can't concentrate on his studies... Nick can't wait to get away from this place each day... and as for your performance last night in front of our guests... I mean, you should be thoroughly ashamed of yourselves. Anyway, if you want to keep on acting like spoilt, selfish children, it's up to you, but I, for one, refuse to live in this atmosphere. So I've come to a decision: I'm moving out. 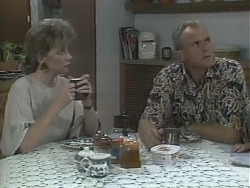 Beverly and Jim stare at Helen in shock.